With only a week's vacation and a spirit of adventure, families can dig deep into a thriving culture of Morocco and share it with kids, who will respond with great enthusiasm. 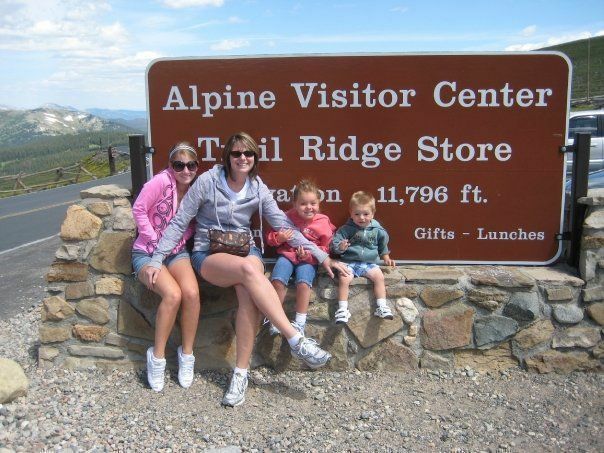 These days, contemplating any family trip lasting more than four days seems like an exercise in futility. Work, school, life — all intervene in our efforts to remain somewhere “other” long enough to understand a different culture. But in exotic destinations like Morocco, where Islamic architecture and camels coexist with fast food restaurants and soccer teams, families can get a huge cultural bang for their buck in a very brief stay. At the heart of all that is Morocco lies Fez (or Fes), founded in 789 by Idris I and his son, Moulay Idris II and populated by Arab refugees from Spain’s Andalucia (el-Andalus). One of four so-called Imperial Cities (along with Rabat, the current capital; Meknes; and Marrakech), Fez’ commercial success made the city one of the world’s largest in the late 12th century. We arrived in Fez after taking an express ferry from Spain to Tangier, then a very slow and not so colorful train from Tangier to Fez. (On this train was an intrepid couple from Maryland with three kids between the ages of 3 and 8 who were on an eight-week sabbatical in Fez.) From any Moroccan train station, families with luggage will need to hire a taxi to get to their hotel, and this is perhaps the toughest negotiation of all, though Moroccan train officials and police will respond to broken French and happily assist you in negotiating a fair price with drivers. Today, Fez’ historic medina (walled inner city known as Fez el Bali) is thought to be one of the largest car-free urban areas in the world. It’s the most intriguing of the city’s three main areas: the contemporary and surprisingly stylish Nouvelle Ville, where locals watch passersby from the outdoor cafes lining broad boulevards; and the medina of Fel el Jadida. Here some other historic attractions, the Mellah or fascinating Jewish quarter, and the celebrated Palais Jamai Hotel, now a Sofitel, are located. Fez el Bali, a designated UNESCO World Heritage Site, has a hypnotic power to transport visitors back a millennium. Along its soiled and sooty cobblestone lanes are butchers carving whole lambs; tanners and dyers creating decorative leather goods; blacksmiths pounding copper, tin and ironwork; masons tiling new buildings and restoring mosaics; tailors repairing homespun blankets; and myriad other artisans. Instead of “cleaning it up,” UN funds have been sparingly used to renovate sections of the medina’s outer wall, restore historic mosques and medrassahs, and provide running water. According to our guide (and a guide is essential here), Morocco’s priority has been to fund training programs for young apprentices at Fez’ many workshops. Acutely aware of the importance of sustainable tourism, the Fez government is committed to maintaining the city’s status as Morocco’s capital of traditional arts while upgrading its infrastructure for citizens. Fez is much less expensive than some of Morocco’s other cosmopolitan tourist centers. So much so, that Fez’ crumbling riads, or walled courtyard houses, are being bought by European families as country homes. With only two days to immerse ourselves in the area, we chose to stay in one, the wonderful Riad Les Oudayas (5/6, rue el Hamia, Ziat, Fes-Medina; 212/61 198 189, 212/35 63 63 03; double rooms B&B from 100 Euros) near the Place Boujeloud. Les Oudayas is constructed around an open-air riad planted with trees and flowers in a style that the owner, Fouad Loudiyi, remembers from his youth. At Les Oudayas and many of Morocco’s riads, six unique guest rooms are designed for passing a thousand and one nights. Hand-paved floors, mosaic inlays on hand-carved furniture, silken pillows and woven throws, low seating areas and sculpted bathing facilities lined with tadelakh (a waterproof stucco) are complemented by other details. At Les Oudayas, we found WiFi at breakfasts composed of croissants, five types of sweet and savory pita, figs, seasonal berry jams and the ubiquitous mint tea. Best of all, the rooftop deck at sunset was a wonderful respite from the bustle below. Essential to the game is a guide, and our riad’s helpful staff contacted Abdel, more formally known as Tazi Chellal Abdelali (write him at 14 Av. 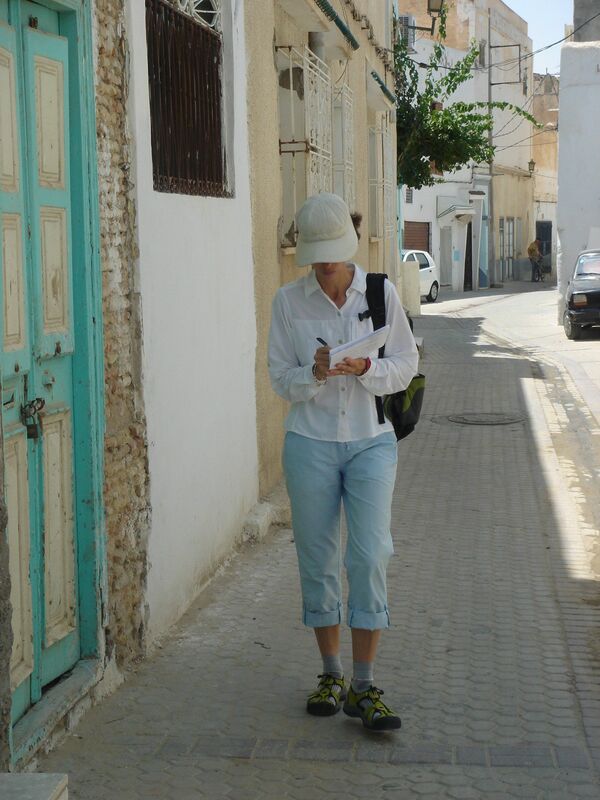 Oran Rue Nablossse, Lots Farida Zohor, 1 Fez Morocco to book sightseeing.) Abdel was just our speed, mild mannered and bright, and he knew everyone in Fez el Bali, where he grew up. Abdel navigated his car to nearby sights first, teaching us about the Moslem tradition of above-ground burial at historic tombs. He drove, recounting the region’s military exploits at the extent city gates; discussing the Jewish diaspora at a synagogue turned shop in the Mellah quarter. As is his daily routine, Abdel stopped at a butcher in the medina to buy ground lamb for kofte, passed by the baker for some bread, then took this to a second floor cafÃ© where we sipped sweet tea and ate olives while the chef cooked our meal. The medina’s Kairaouine Mosque, since 857 one of the leading universities in Islam, was next. It is named for the holy mosque at Kairouan in Tunisia and is only partly accessible to non-Moslems. Then we went shopping. A celebrated white clay is the base for exquisite Fez pottery. Sculptors make the intricate, geometric Fez mosaics seen on walls and ceilings throughout the country. Leather craftsmen who dye camel, goat and sheepskin in the local tannery then stitch it into babouche slippers, accessories and clothing. The ubiquitous carpet dealers lend color to the gray stone lanes. Fez is a thoughtful shoppers’ paradise. Several shops have factory areas where you can watch the artisans work and become attuned to quality. Two that stood out from our time with Abdel are the Fez Mosaic and Ceramics Cooperative, in the Quartier de Poterie at 32, Ain Nokbi Route Sidi Harazem (212/035 76 16 29, 212/055 64 97 26; ), and one of the many Fez antique and art dealers catering to a Paris and Casablanca clientele: Guennoun’s Art Gallery at 1, Derb Touil Blida (212 55 63 62 88, 212 061 17 43 60; a_guennoun2003@yahoo.fr). We were shameless in our purchase of ceramics, dinnerware and fabrics and ordered a small mosaic fountain to be shipped to our home. It graces our foyer today. To get from Fez to our next stop, Marrakech, we were recommended an English-speaking Mercedes taxi driver, Nagiri Youssef, simply called Youssef (Taxi Touristique #540, book him at GSM: 061 702 495 or write to him at his home: 7, rue des Philosophes, Sefran, Morocco.) 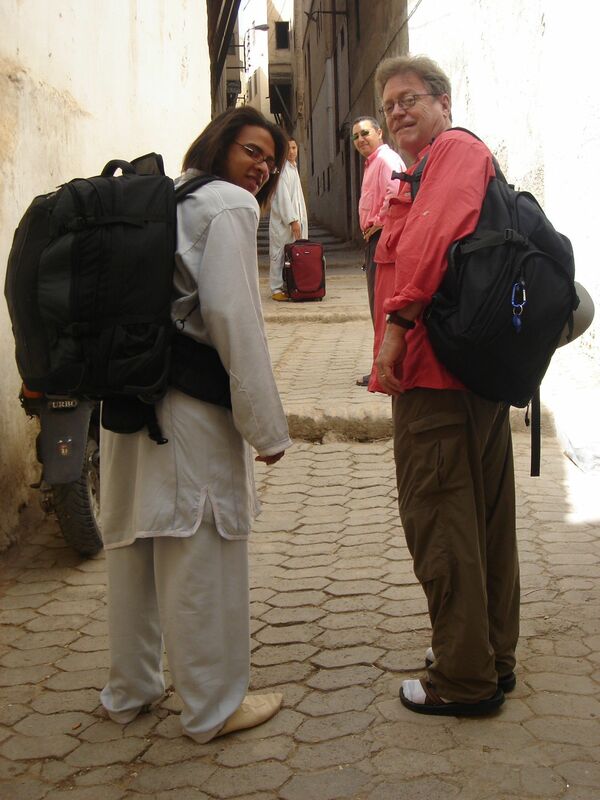 As with many such arrangements, Youssef was much more comfortable speaking French than English, but his knowledge of Moroccan customs augmented the journey, and his appetite for regional cuisine allowed us to stop regularly at roadside stands offering local specialties. This made the comfortable eight-hour journey speed by. “In the heart of the heart of the city that is the crossroads of the world” is how our guide introduced Place Jemaa el Fna, the enormous open square in the midst of Marrakech’s walled medina. 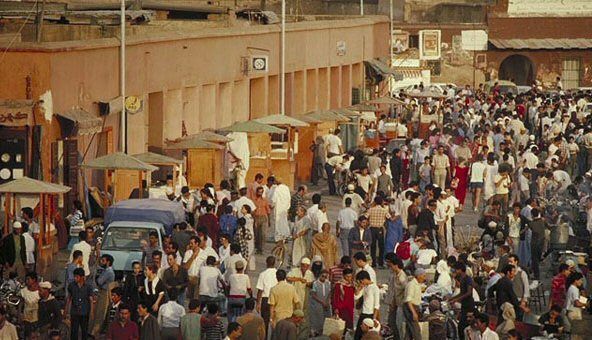 Marrakech is a much larger city than Fez and more easily accessible to travelers who want to explore on their own. Families especially will appreciate being near this extraordinary town square that attracts juice vendors, musical performers, pickpockets, snake charmers, transvestite belly dancers and more. Day or night Jemaa el Fna has something going on, with crowds gathering around street entertainers or the hundred plus stalls grilling meats and local specialties at night. From Jemaa el Fna, if you could rise over the old city walls, you’d see the Old Town of Marrakech and the right-angled minaret of the Koutoubia Mosque. Simple in style with a band of glazed tiles, it typifies the architecture of the Almohad Dynasty. From here it is easy to sightsee; a good map helps but many locals speak some English as well as French, and all are used to tourists. Work your way through the hundreds of fascinating residential lanes past the many workshops, to the souks of clothing and shoe boutiques, art galleries, cyber cafes, jewelers and antique vendors that call Marrakech home. Ensemble Artisans is the government’s fixed rate shop on avenue Mohammed V; a good place to start learning about quality and traditional Moroccan workmanship before exploring the souks. Families will feel very comfortable sightseeing in Marrakech without a guide, though having a knowledgeable companion to answer children’s questions, or an advocate if you’re planning to do some real shopping, is a plus. Among the city’s highlights are the Tombs of the Saadian Kings, whose above-ground resting places are elaborately decorated; and the ornately decorated Bahia Palace tucked into the medina close to the old Jewish quarter. Along the Place de Foucauld, the horse-drawn carriages or caleches await those who want to inspect the kasbah or walled ramparts of Marrakech. View the six miles of rose-colored, 12th century city walls and 20 city gates from the comfort of a carriage. (The Musee de Marrakesh), founded by industrialist Omar Benjelloun, offers a collection ranging from contemporary paintings to calligraphy and historic sculpture. The museum occupies the restored former Menebhi palace and is well worth a visit. Nearby on Place Ben Youssef is the Ben Youssef Medrassah, especially interesting because its restored marble rooms housed schoolchildren studying the Koran from the 16th century. The classic mosaic fountain in its courtyard was used for washing before prayers. Another Arab tradition is celebrated at Les Bains de Marrakesh, a hammam or Turkish bathhouse located in the Riad Mehdi), an elegant guesthouse with its own interior garden. Les Bains offers a full range of treatments from the Turkish steam rooms to contemporary massage techniques; babysitters are available if you succumb to a day-long treatment. The city’s luscious gardens, which can be seen by guided or self-guided tour (Club Med has a half-day excursion) are an unexpected pleasure in the depth of summer. The historic Menara Gardens date from the 12th century Saadian rule and are best known for the royal pavilion that sits on the shore of a large manmade lake fed by ancient irrigation channels. The most famous and perhaps most beautiful garden is the Jardin Majorelle, open daily from 8am-7pm, till 5pm in winter. The garden was founded in 1924 by the French painter Jacques Majorelle, whose own landscapes of Morocco are hung in his former studio, now the Musee D’Art Islamique. A devout botanist, Majorelle brought back dozens of unusual species from his worldly travels, then planted them in a creative frenzy of color and shadow that so inspired his neighbor, the couture designer Yves St. Laurent, that the St. Laurent/Berge Foundation bought the garden after Majorelle’s death and ensures its maintenance to this day. Just as in Fez, our stay in Marrakech was colored by our accommodations at the traditional Moroccan style Club Med la Medina off Jemaa el Fna. One of the benefits (and drawbacks) of Club Med is the exposure to French families on holiday, many of whom preferred spending time at the sister resort, an isolated golf resort called Club Med La Palmeraie, to our low-key “urban” compound. Since we are dedicated sightseers, we felt safe and comfortable in a center city location and ignored it being “all-inclusive” to try dining at several Marrakechi restaurants. The reasonably priced Chez Chegrouni serves a fine tagine on the edge of Jemaa el Fna. If you’re ready for continental cuisine, the medina’s Le Foundouk is a trendy alternative with a moody Euro style. The Comptoir in Gueliz, the nouvelle ville, is also highly regarded by ex-pats. Follow up either meal at the CafÃ© Glacier, where you can order an ice cream or a cool drink and overlook the square’s action. Later in the week, we preferred to save our celebratory Moroccan meal for a restaurant that also had a folklore and belly dancing dinner show, and this is enough to engage children of any age. Dar Moha is the former Marrakech home of couture designer Pierre Balmain and its cuisine, walled garden, musicians and tasteful dÃ©cor make for an unforgettable evening. In regards to lodging, Marrakech also has a full complement of restored riads and elegant hotels. Note that the palatial La Mamounia Hotel has been closed for a renovation expected to last a few years, but the Farah, more formally the Golden Tulip Farah Marrakech, is a comfortable and contemporary hotel with a large pool suited to families. Among the highly regarded riads, the larger Les Jardins de la Koutoubia (212/44 38 88 00) has 72 air-conditioned rooms with TV sets and other comforts around a large garden and pool. The smaller, budget Riad de l’Orientale in the medina has a few two-room suites that can accommodate four; rates including breakfast are rock bottom for attractive but Spartan accommodations. On the other end of the expense spectrum is Villa des Orangers (212/44 38 46 38), the local Relais & Chateaux property set in a tiny orange grove behind high walls. More formal, with a quiet lap pool and an excellent French-Moroccan restaurant, it’s a chic and totally upscale choice. Our car and driver were waiting early one hot morning to take us to the cooler mountain air and Berber culture of the lower Atlas Mountains. From Marrakech south the route twists painfully through dry hills dotted with scrub brush and up and over broken sand roads reminiscent of Babel, which was filmed here. Small farmhouses with mud brick animal pens and crumbling kasbahs appear on the horizon at every turn. That one was just bought by Sir Richard Branson for his latest hotel project shouldn’t surprise you; this rustic and still unspoiled region of intense natural beauty is a favorite weekend getaway for Marrakech’s moneyed crowd. We had a choice between the more traditional villa style of La Roseraie (booked through Unchartered Outposts), with its manicured rose gardens and formal lobby, and the funky farm feel of Le Bergerie (booked through Naturally Morocco – double room with half board US$90/day). We chose a rustic, simply furnished cottage room overlooking some noisy roosters and the mountains and a half-board package, because the French couple who own Le Bergerie have earned a reputation for their country French style cooking. Le Bergerie’s low key inn, small pool, and friendly, largely ex-pat crowd provided an ideally quiet break in a long stint of serious sightseeing. With nothing more than an hour’s notice, the inn produced an English-speaking Berber guide who led us on a six-hour, five-mile roundtrip walk (US$125) to see his home and other surrounding Berber villages. We had a quiet chicken tagine lunch prepared by his mother, marveled at how many stucco homes without running water had wireless Internet access, and learned more about the unique and proud Berber culture, a tribe that distinguishes itself from Moroccan Arabs. There are other possible excursions deeper into the Atlas Mountains, and as far as the edge of the Sahara. The Kasbah du Toubkal (212/24 48 56 11) has become somewhat of a rustic industry since the world glimpsed its sky-high charms in the film Kundun. It’s located about two hours south of Marrakech in the scenic lower Atlas mountains near Jbel Toubkal, North Africa’s highest peak. This hilltop enclave has deluxe rooms at the kasbah accessible by mule or foot; more rustic dorms and private ones in the Dar Toubkal in the roadside village of Imlil below; and at the new Toubkal Treking Annex, a six-hour hike away in the Azzaden Valley. Hiking is the point of course; double rooms range from cheap to not at all cheap, depending on the amenities, whether or not there’s a private bathroom, and the number of people in your party. For a two-night excursion that promises camel sightings, many families like to explore the unpaved roads that cross the brick red, striated valleys of the High Atlas. The main destination is usually Ouarzazate, home to the country’s largest film studios dating from the days of Indiana Jones. Popular four-wheel drive side trips (arranged in Ouarzazate or through your Marrakech hotel) lead to Zagora and eventually, after a night in a rustic B&B, to a Bedouin camel safari. As much as we longed to try this, we were repeatedly told that with the winds off the Sahara and the summer weather is too hot for most foreigners to tolerate. After the stunning heat of urban Marrakech and the cooler Atlas sojourn, we continued east toward the welcoming breezes of the Atlantic coast. A half day’s drive took us through Taroudant, known as “Little Marrakech” because of its city walls and wonderful souks, site of the famous resort called La Gazelle d’Or. Knowing it was the playground for many a French premier, we stopped to walk around the lovely grounds. 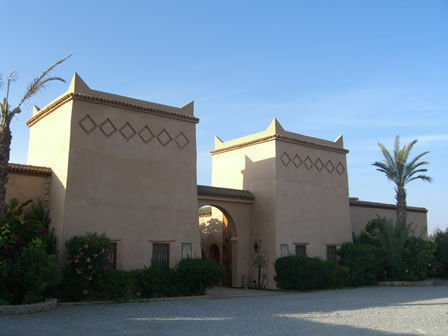 We had a wonderful meal at Dar Zitoune and decided that this pleasant traditional style hotel in historic Taroudant was a good base for daytrips to the Atlas Mountains. The coastal cities of Agadir and Essaouira are also nearby – this may be a good base for a return family trip. One of our favorite memories of Morocco is seeing goats climb high into the gnarled argan trees that line the roads outside Taroudant, where they eat the fruit and excrete the nuts from which the highly prized argan oil is derived. From the United States, Royal Air Maroc flies non-stop from New York to Casablanca, a journey of just six and a half hours. The city is also served by several daily flights from Montreal, Quebec, Canada and Paris, France. As Morocco’s banking and commercial center, Casablanca is well connected by air and rail to all the major tourist destinations but does not warrant a long stay. Several trains daily run to Fez, and private taxis can be easily be booked at the airport. From Europe, ocean-worthy ferries and high-speed hydrofoils ply the route from Algeciras, Spain past the Straits of Gibraltar to Tangier dozens of times a day. The 1.5 to 2.5-hour journey costs about Euros 35 one-way for passengers, and about Euros 200 for automobiles. From Tangier, families can rent a car, take a train or fly on to the next stop in Morocco. At the port, families with young children will have to choose between squeezing into a local or petite taxi, or a larger, air-conditioned Mercedes sedan seating five (at a higher rate). Although we did not arrange most of our drivers ahead of time, we got very lucky. Our host introduced us to the smart, articulate Asfalou Lahcen (known as LAH-sen) from Maroc A La Carte, who can be booked through his cellphone at GSM: 212 62 45 40 37 or by email at oufliyene1@yahoo.fr. Lahcen’s knowledge of the countryside and his sensitivity to our interests (suggesting we stop at a little known ceramics museum on the coast north of Agadir, for example) made the trip much, much richer. Not to mention the comfort of his Toyota SUV. So, if you do plan your transportation in advance, you’ll be spared some moments of anxiety but in the current economy, there are likely more conscientious and careful driver/guides available than the demand for them. By the way, tipping is customary and highly appreciated; 10% is the standard. Tip your driver/guide, trekking guide, taxi or hotel staff with small change in Moroccan dirham or Euro coins. The government has cracked down on the unlicensed guides and touts who used to make sightseeing or shopping in the souks almost unbearable, but there are some who evade detection; avoid them! However, there are many genuine beggars who rely on the charity urged by the prophet Mohammed, so you may encourage the kids to give to them. The cooler months from October to April are ideal in terms of weather; families will be spared the harsh desert winds and elevate summer temperatures in the low 100s. Easter and Christmas are popular times for Europeans to visit; try to avoid the month-long fasting holiday of Ramadan which usually falls between September and November because many restaurants shut during this period. Next Article Next Article College Blah turns Family Hoorah!